The Dancing Shiva represents the changes in the universe around us, as matter and energy constantly bump into each other, create and destroy systems and keep renewing the world. I suppose we can attach any meaning we like to this, the constant chatter of culture, the renewal of our population as people die and children and born, the violent cosmological events that keep reorganizing the universe. Any and all of these interpretations are beautiful, powerful and majestic, but for me there is one interpretation which excites me more than any other and holds a very deep truth in it. 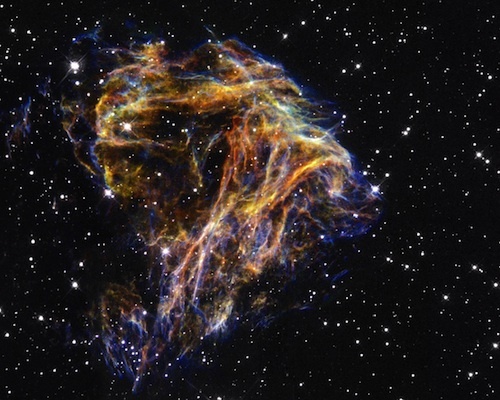 This cosmic dance is the interaction of matter and antimatter. Whenever we create new particles we create them in matter-antimatter pairs. They are literally equal and opposite components that make up everything we see. When they meet, they destroy each other in a burst of energy. If that was all there was to matter and antimatter, it would make a rather beautiful cosmic ballet, but not an interesting one. The fascinating part of the story is when we remember that we have more matter than antimatter, which means that this particular cosmic ballet is unbalanced, and the statue is a constant reminder of this fact. The universe knows something we don't. And it acts on cosmic scales. We don’t know why nature prefers to matter to antimatter, and until we know why we can’t really claim to understand how the universe works. We know how one mechanism has a preference (the weak force interacting with quarks) but this is much too small to explain the whole story. Whenever collide protons together at the LHC we have to live with the fact that we’re colliding matter with more matter in a detector made of matter. The particles that escape are not quite half matter half antimatter, as we might like. After a while, all the particles (except the neutrinos) slow down, decay and hit some rock. They join the rest of the stuff around them and either annihilate or get comfortable and settle in with their surroundings. All we’re really doing is moving matter around in a very complicated way; nature balances the books and every piece of antimatter we created (except the antineutrinos) gets removed from this small part of the universe. The cosmic dance continues, and if we’re lucky we get a small glimpse into how it really works. On the tiny, insignificant scales we work on we don’t see much of an imbalance at all. When we look up to the stars we see matter everywhere we look, across vast distances and far back in time. Nature’s balance sheet has a few implications for our physics. For example, every time we produce a Higgs boson, we also produce a lot of noise in the detectors as well. In a matter-antimatter collider (such as LEP or Tevatron) this is less of a problem, since the Higgs boson is neither matter nor antimatter, it’s equal amounts of both. To create a Higgs boson we would need to create at least one antiparticle, and that takes a lot of energy. With this extra particle we get a lot more particles “for free”, leading to all kinds of noise! So in the light of day, when CERN is teeming with life Shiva seems playful, reminding us that the universe is constantly shaking things up, remaking itself and is never static. 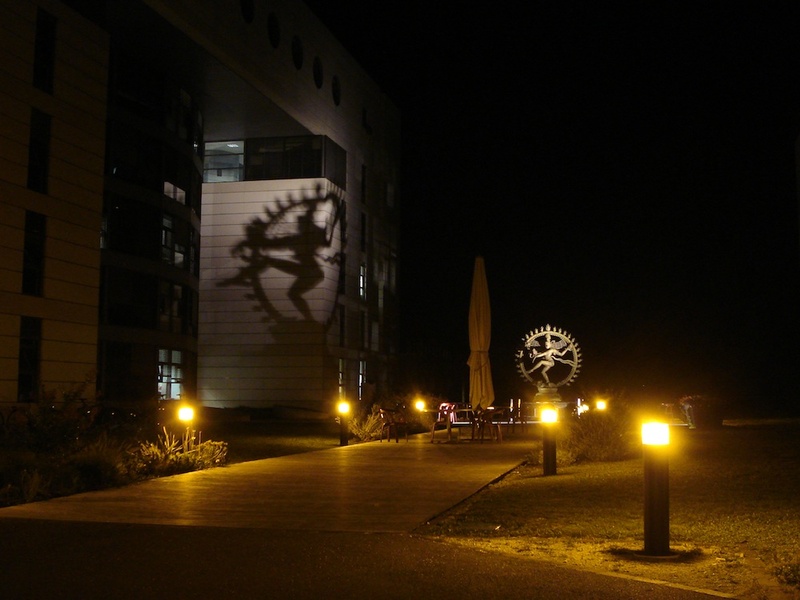 But by night, when we have more time to contemplate the deeper questions Shiva literally casts a long shadow over our work, a bit like the shadows on Plato’s cave. Shiva reminds me that we still don’t know the answer to one of the biggest questions presented by the universe, and that every time we collide the beams we must take the cosmic balance sheet into account. It’s rare that we get a symbol that inspires both clarity and beauty. It’s almost poetic. Why does Shiva prefer to destroy antimatter more than matter? The more data we gather the better chance we have of finding the answer to that question. I don’t think we’ll ever stop wondering about this question. It’s the reason there’s something instead of something and antisomething. It’s the reason atoms exist and stars can form. And yet the answer is still out of our grasp.